In some places children have already returned to school with the anticipation that the start of a new adventure brings. Locally we have another week to wind down our summer. 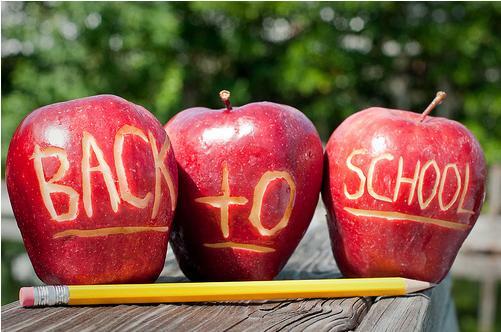 Even though the private school where I’m employed as a counselor and nutrition consultant is a year round school I still get that beginning of the school year feeling. It’s something between excitement for all the possibilities and melancholy about the end of another summer season. In keeping with the beginning of the school year theme as it relates to my health coaching practice, I wanted to share some ideas for how to pack healthy, brain food for your child/ren that doesn’t set them apart from their peers. Let’s make eating healthy the cool thing to do this year and see if it can become the new cool. Something as simple as cream cheese (or Tofutti dairy free cream cheese) topped with fresh fruit is sure to grab kids attention. Other ideas range from fruit kabobs to assorted wraps. Most fruit will keep in a lunchbox and when it’s as easy as sliding off a skewer into your mouth who can resist. We can create so many variations of wraps that it’s limitless. In fact, in many schools they are slowly replacing white enriched bread with whole grain breads and wraps. 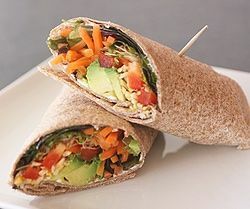 Wraps are an easy way to include vegetables in your child’s lunch in a way that they will eat them. If you can make the time to engage your child in the preparation of these beauties they are more likely not to trade them away for a snickers bar. My favorite wrap to teach children to make in my Cool Kids Cooking Class is the California wrap which includes avacado, sprouts, cucumber, carrots and cheese (if your child can tolerate dairy). It always makes me smile to see how quickly kids take to eating healthy when they are part of the preparation. I also suggest getting to know the lunch ladies (and gents) who are preparing school breakfast and lunch. Be kind to these hard working people and let them know that you appreciate their efforts. Congratulate them when they have made something healthy and kid friendly. Offer your ideas about improving school meals in a way they can hear you. One thing I’ve learned over the years is that people respond better when you are willing to walk with them on their journey than when we give the impression we know what’s best. If you are involved in your child’s school you may want to get involved in changing school food programs so that all children enjoy a healthier meal. For some children these are the only meals they eat each day so keeping it nutritious means they can attend to learning and the other challenges school brings. One of the many challenges educators face is holding all children to a standard. When a child experiences food insecurity it can be nearly impossible for them to focus on English or math. Educators are all too aware of these challenges. An example of what a couple moms did in Berkeley California to change the school lunch program in their children’s school is the movie “Two Angry Moms.” It outlines what isn’t working with school meal programs and shows how they went about dramatically creating the change in their school. It is one example of how to start thinking about the food we eat and provide to school children. This entry was posted in Cooking for Health, Food Politics, Health Coaching, poetry, Whole foods cooking and tagged california, cooking with children, family, gratitude, happiness, Health coach, healthy eating, healthy recipe, Institute of Integrative Nutrition, macrobiotic, nutrition education, poetry, recipes, vegan, vegetarian, Whole foods cooking. Bookmark the permalink.